We are delighted to premiere new music from Polish pianist and composer Kuba Kapsa, taken from his forthcoming album ‘Supersonic Moth’ released at the end of the month via Germany’s Denovali Records. The world-renowned German independent label Denovali return with the first releases in 2019 coming at the end of March. “Supersonic Moth”, the wonderful new album by Kuba Kapsa, who is a Polish pianist and composer – also known as the leader of the avant-jazz combo Contemporary Noise Sextet. Beyond that he’s a renowned composer for film and theater plays. “Supersonic Moth” is basically written for upright piano played through felt, programmed electronic sounds and processed piano recordings in order to create in-depth atmospheres and sonic landscapes with a wide range of stimulating moods. We are delighted to premiere the album’s utterly spellbinding penultimate track ‘Reliever’, built upon hypnotic electronic soundscapes interwoven with sublime piano patterns. 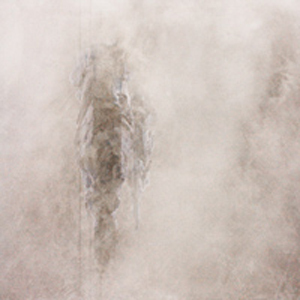 The towering crescendo serves one of the highlights of Kapsa’s latest master-work, creating a highly emotive modern classical exploration. ‘Supersonic Moth’ is out on Denovali Records on 29th March 2019. 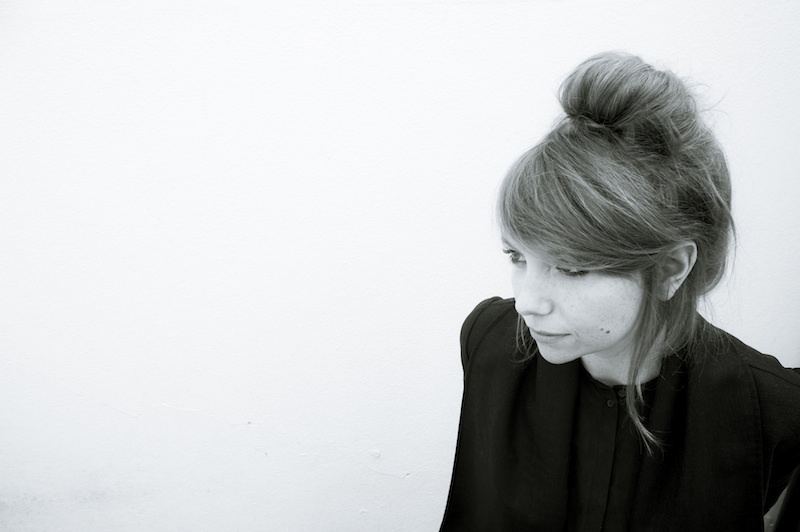 Poppy Ackroyd is a composer from London, currently based in Brighton. Classically trained on violin and piano, she makes music by manipulating and multi-tracking sounds from just these two instruments. Her debut ‘Escapement’ was released in December 2012 by Denovali Records and a DVD – ‘Escapement Visualised’ – featuring bespoke visuals by Lumen for each track on the album, was released in September 2014. ‘Feathers’, her second album, was released in November 2014, and builds on the concept behind her debut, with most of the sounds again coming from the violin and the piano, however this time the tracks also feature other keyboard and string instruments. On the sublime sophomore full-length, a larger sonic palette is utilized by the gifted composer; including an array of acoustic keyboard instruments such as harmonium, clavichord, harpsichord and spinet. Furthermore, the immaculately crafted string section is augmented by guest cellist Su-a-Lee. Similar to the enchanting debut record ‘Escapement’, Poppy’s trusted Blüthner grand piano forms the backbone of the album. A myriad of field recordings (traffic noise on ‘Roads’ and chiming clock walls on ‘Timeless’) are dotted across the album’s sprawling sonic canvas that further heightens the magical sense of discovery rippling through the majestic waves of piano and violin melodies cast by Ackroyd. The infinite beauty distilled in ‘Feathers’ becomes a wonderful symbol of new beginnings as one catches a glimpse of a bird in full ﬂight; majestically owning the vast blue skies ahead. ‘Feathers’ is out now on Denovali Records. Congratulations on the stunningly beautiful and mesmerizing new record, ʻFeathersʼ; you must feel deeply proud of this divine work of art. Firstly, can you please discuss the sonic palette at your disposal this time around? On ʻFeathersʼ, the sonic terrain is expanded to include various other acoustic keyboard instruments and guest-cellist Su-A-Lee. I would love to gain an insight into these new branches to your distinctive piano/violin-based compositions? Poppy Ackroyd: Thank you! On ‘Feathers’ I decided to expand on the sound world of my debut album ‘Escapement’, and bring some other keyboard and string instruments into the mix. On the new album you can hear clavichord, harpsichord, spinet and harmonium, as well as old pianos – my favourite being a Broadwood piano with a wooden frame, from the late 18th century. These other instruments are all more delicate and intimate than the modern grand. They were designed for smaller spaces, and were instruments that people would have in their homes, they were not designed to project, so are all very quiet and this gives them a more intimate feel. I like that they all have different mechanisms for producing sound, so there are a variety of timbres – for example, the clavichord uses a tangent to hit the string, the harpsichord has feather quills (or other materials such as soft leathers) that pluck the string, and the piano uses felt hammers to strike the strings. In a similar way to how I treated both the violin and piano on ‘Escapement’, I also played with these other instruments, using their frames, pedals, sound boards, strings, tuning pins and mechanisms. Because of the low volumes they produce when played, I had to record very closely and this created a more intimate world – you can hear more of the imperfections…the creaks, clicks and there are also very slight irregularities in tuning. Su-a Lee performed cello on almost all of the tracks on the album, except ‘Taskin’ – which is all keyboard instruments and almost exclusively just made from recordings of the Taskin harpsichord in the museum. She makes such a gorgeous sound on the cello, it really transformed all the string sections on the album to have that extra depth from the bass notes. Similar to the debut ʻEscapementʼ, your beloved Blüthner grand piano serves the vital pulse to the recordʼs sprawling canvas of sound. Similar to pianists such as Nils Frahm, Hauschka et al, I am always amazed by the new sounds and endless possibilities you generate from the instrument. Can you please describe this particular instrument and indeed the approaches and processes you have utilized on ʻFeathersʼ? PA: It is a Blüthner boudoir grand, and it is my favourite possession. The day I decided to buy a grand piano it was put online for sale, and it was exactly what I was looking for. It was in a terrible state when I bought it though – most of the keys were stuck together, as the lead weights in them had expanded from being kept near a ﬁre, and so it was kind of unplayable, apart from about two octaves near the top of the keyboard. I immediately ﬁxed the problems with the action and keys, and since then have gradually been doing it up. It has Aliquot stringing which means that the upper register has sympathetic strings that resonate with the main strings when they are played, so the melodies really sing. It is beautiful… I use every part of the instrument when I am writing – the wooden frame, the cast iron frame, the strings, the pedals – and play with my hands, plectrums, ebows and various percussive beaters and instruments. I record and then edit, chop and piece the sounds together, to create different beats and textures. Often I use various effects to alter and manipulate the sounds. After starting with a melody or chord sequence, a lot of the composition is done after recording. I record, and then start to sculpt something. Once there is a loose structure, the melodies and harmonies start to change, and I then record again. The end result is often very different from where I started. The use of ﬁeld recordings adds a further dimension to the deeply personal and affecting musical compositions. I am curious whether some of these ﬁeld recordings provided the starting point to compose a piece of music, Poppy? For example, ʻTimelessʼ begins with chiming wall clocks. In a way, these ﬁeld recordings – the percussive effect of chiming clocks; trafﬁc noise from a vibrant city on ʻRoadsʼ – become central characters to the albumʼs gripping narrative. Please discuss some of these ﬁeld recordings and the sources of these found sounds, so to speak? PA: I use ﬁeld recordings when I feel they can add to the story of the track. The trafﬁc on ‘Roads’ is recorded in the centre of Brighton, I like the way the sounds of the passing cars create a feeling of movement and journey. The sounds of the waves and the sea on ‘Birdwoman’ is also recorded in Brighton, walking along the beach and then right down to the shore. For ‘Timeless’, I was playing with the idea of time – the track is in 120bpm, the main beats falling 60 in a minute, therefore every second like a clock. The ﬁeld recordings came later. I came across an old clock in my cousin’s shop – she sells vintage furniture and other things. The chimes and mechanism start quite freely but from quite early on each sound is positioned and chopped, gradually becoming a beat, that continues for the rest of the track. One of my current favourites is the gorgeous ʻTimelessʼ and the utterly captivating dialogue between violin and piano inherent in the piece. Can you talk me through the layering of this particular composition? PA: This track started out as a solo violin piece and I wrote the initial ideas using just a violin and loop pedal. The pizzicato came ﬁrst and then the main ‘Tick tock’ sound which is actually ﬁngers on muted violin strings. Gradually the bowed strings come in and the track builds. The meandering piano line came later, in order to contrast with the rigidity of the violin pizzicato, and the beat. The reverse notes, (these are reversed plucked inside piano strings) are also there to pull the track away from its strict time keeping. When everything falls away in the middle, the slightly freer quality of the plucked inside piano notes, and the lyrical piano melody intend to create a feeling of space and free time. I think this is my favourite part of the album. The beats are made mostly of violin sounds and there are quite a few layers, and these are also combined with the beats made from the mechanism of the clock. I was very interested to read how the album-title was inspired by the line “Hope is the thing with feathers” by Emily Dickinson. For me, itʼs a wonderful symbol of new beginnings as one catches a glimpse of a bird in full-ﬂight; majestically owning the vast blue skies ahead. Please discuss the albumʼs narrative for me, Poppy and what central themes you feel connect these eight sublime sonic creations? PA: The line of the poem is actually only partly responsible for the album title. This quote was lying around in my ﬂat when I was starting to write and it really resonated with me, and the title track ‘Feathers’ deﬁnitely owes its name to this line. Over the months I was writing, other factors started to come into play. A feeling of lightness and delicacy was present in all the tracks, my moving house and general travelling lifestyle created a theme of ﬂight and migration. 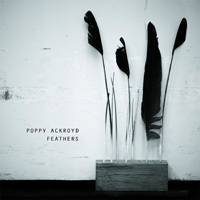 The fact that some of the instruments in the museum used quills from crow feathers in their mechanisms (like those pictured on the album cover) to pluck the string, made it seem like ‘Feathers’ was the obvious title. Can you reminisce for me your earliest musical memories? You are classically trained on the violin and piano from a very young age; I would love to know what common ground you must have discovered as you developed on both instruments? It must be quite liberating to have this dichotomy of worlds, so to speak where both these worlds ﬂow nicely into one another. PA: I have so many early musical memories, it has always been a big part of my life. I think I owe a lot of my interest in music to my father, however it was my mother who pushed me to practice and made me work at it when I was little. My father is an artist and always listens to music while he works, I grew up with Bob Dylan, The Rolling Stones, Chopin, Mozart and Schubert amongst others. By studying both these instruments from a young age, obviously one informed the other, but my experience due to my various teachers and the different environments in which I studied each one was quite different. The main crossover was thinking and listening to the sound I made on each instrument. Learning to take an interest in the composer and of course the music itself, thinking about the story and why the music was written, and then considering how best to express and perform it. As ever, you are involved in various other projects, most notably the wonderful Hidden Orchestra, in addition to composing scores for dance, ﬁlm, theatre and radio. I would love to gain an insight into the collaborative aspect of these ventures, particularly your involvement with Hidden Orchestra which has been (and continues to be) an awe-inspiring musical collective? PA: My role in Hidden Orchestra is as a session musician. 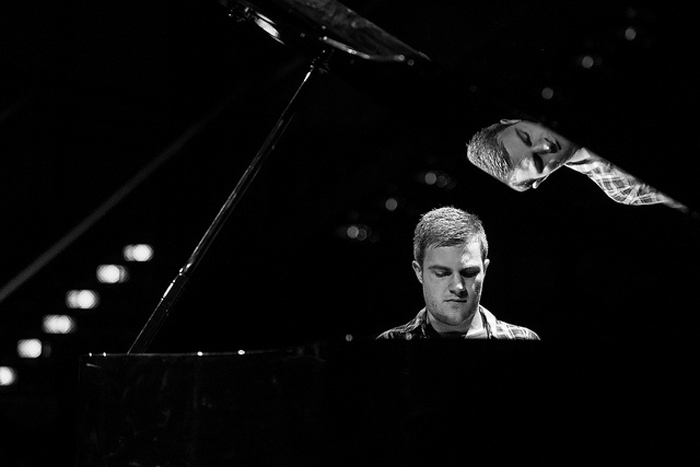 It is actually just Joe Acheson who composes all of the music, it is really his solo project. We record for him during the writing process, then after the album is ﬁnished we come together to tour the tracks live. There are four of us who have been there since the beginning, and often now we feature guests on trumpet, clarinet, cello, harp, visuals etc. What records have you been listening to the most lately? I wonder do you have plans and works in the pipeline? PA: When I am writing I can get really involved in what I am doing and after 12 hours of making music I just want silence, or I listen to the radio or a podcast. However, in the morning I usually listen to something new while I wake up, and I try to listen to something different most days. I am currently working on some new material and also a few collaborations, including music for a short animation. 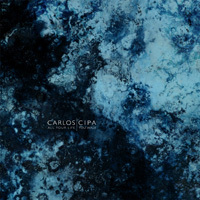 Last November marked the highly anticipated sophomore full-length release from the gifted Munich-based composer and multi-instrumentalist, Carlos Cipa. ‘All Your Life You Walk’ is a collection of stunningly beautiful piano-based compositions; representing an artist at the height of his powers. The latest offering – and follow-up to Cipa’s mesmerising debut ‘The Monarch and the Viceroy’ (both albums released on the prestigious German-based Denovali imprint) – features an array of rare instruments, found sounds, atmospheric touches and gentle beats that evokes an utterly timeless and deeply affecting experience. ‘All Your Life You Walk’ is available now on Denovali. Congratulations Carlos on the incredible new album, ‘All Your Life You Walk’. It’s a real pleasure to talk to you again and discuss this very special record. Firstly, I love how the musical compositions are deeply embedded in this entirely other space and dimension. For example, the inclusion of several fragment pieces – dotted throughout the record – adds to this sense of journey and how ‘All Your Life You Walk’ is a captivating and cohesive whole. Please discuss the making of this new record, Carlos and please shed some light on the album-title and the ideas you wanted to explore on ‘All Your Life You Walk’? Carlos Cipa: Thanks a lot for all your interest in my work and these kind words, it’s a pleasure to speak with you again and talk about my new album with you. I’ve been working on the compositions, musical ideas and the whole concept of “All Your Life You Walk” over the last two years but the main part of the work has been done in the summer from June to September (2014). First, I finished composing all the piano parts and piano solo songs and then recorded everything on piano only. After that I continued working on writing and recording the fragments and the different colours I wanted to add to the certain songs. Every sound and instrument is carefully chosen. It’s just the exact amount of instrumental facets I wanted to add to the songs. The title is a reference to a favourite poem of mine by Kurt Tucholsky called “Augen in der Großstadt” (engl. “Eyes in the Big City”). One of the lines has been translated in English; also all the song titles are references to different things that inspire me, films, song lyrics, poems, etc. My current favourite is the sublime ‘Hang On To Your Lights’, I particularly love the rhythmic and percussive elements to your piano playing. Are there certain techniques or processes you have expanded on this record? In terms of writing, I wonder is a piece like ‘Hang On To Your Lights’ quite a gradual unfolding before the music is given its wings, and in full-bloom, so to speak? CC: That’s great, it might also be my favourite. For this piece I really took long time to develop the composition. I worked strictly with scores for the piano part, so everything was written down before recording. The pattern in the right hand is developing throughout the whole piece, but the bar is always changing so you never get a feeling of rest (the piece has nearly 80 bar changes and several different tempi). The rhythmic elements are sounds from the inside of the piano; I created the beat with felt beaters on the cast iron frame and then processed it a bit with the computer. The drone/ambient sounds are piano strings plucked, bowed, picked recorded and cut, processed and layered in the computer. For a piece of that length, that’s based on a little loop pattern, I believe it’s really important to be absolutely precise with every bar in the piece and to create a million little details so it never gets boring and you’re always able to explore something new in every second of the piece. You collected a wide array of fabulous instruments that have found their way on ‘All Your Life You Walk’, further heightening the deeply personal sound of the creations. I would love for you to discuss these instruments and the beautiful stories that are behind each and every one of these special instruments. For example, are the first notes heard on the album the sound of the radio receiver belonging to your grandparents? Also, the very rare instrument built by Hohner in the 60’s must have been a miracle of a discovery for you? CC: I’d love to talk you through them. Let’s start with the “Hohner Guitaret”; it’s been built in the 60’s only for a very short period of time. It was meant for use in a Jazz combo but never really found its place there. It’s a “kalimba-phone” instrument but with electroacoustic pick-ups, so it can be used similar to a guitar, but has a totally different, very unique sound. You can hear it on tracks 3, 4, 9 and 11. I processed it with a variety of effects. Then there’s the “Marimba” (heard on songs 3, 4, 5, 9, 11), it belonged to a childhood friend, and he stopped playing at a certain age and the instrument was getting all dusty in their attic until I asked him if can use it for recording and now it has it’s own space in my studio. The same goes for the “Hackbrett” (heard at the beginning and throughout song 11) but this was actually the instrument of his brother, another childhood friend of mine. The radio receiver is as you say the beginning and ending of the album. I’ve the great luck to live and work in the house my grandparents built by them in the 50s after the war and I wanted to make a connection to them and to the space. This radio receiver was in their possession for a very long time and even if it doesn’t sound “perfect”, I am very happy that it has found its way on the record. The E-bass (also on tracks 3,4,9 and 11) is a very rare jazz bass built by Framus in the 60s, I discovered in a vintage music store here in Munich. I just love the wooden sound and how it melts with the piano and all the other instruments. Then there are a variety of percussion instruments I collected over the years, a glockenspiel, a sansula, an ocean harp and some African instruments. I also added a second piano sound to my music; it’s coming from an upright piano, played with the felt pedal. I bought this beautiful instrument from an old lady who stopped playing and I really love how the mellow sound melts with my grand piano. All other sounds are piano inside sounds, plucked strings, bowed strings, e-bowed strings, muted notes, harmonics, layered and processed in the computer. I would love to gain an insight please onto the space of your very own “Beatschuppen Studio”? What is the set-up in the studio itself, Carlos? CC: As said before, I am living and working in the house of my grandparents, it’s an old house from the 50s and I built my little studio in the basement over the last few years. I work in two rooms and my grand piano is upstairs in the living room, so most of the time recording means running up and down stairs… it keeps you fit, though. At the moment I am working with RME interfaces and pre-amps and mostly Neumann microphones, I prefer to keep it simple and this setup is working out just fine for the moment. I can also shed some light on the name of the studio; one of the basement rooms was the child room of my mother when she was growing up in this house and she used to be a big fan of the Beatles (like me) and so she used to call her room like that (in English kind of like “beat music shed”). I thought it’s a funny name for a studio. I love the cinematic feel that permeates the cathartic ‘Step Out From Time’. Can you talk me through this piece of music please? CC: I think you get this feeling because this piece might be the one that has the least solo-piano feel to it. This might originate mostly in the instrumentation/production. I divided left and right hand into two different instruments (the right hand plays the melody on the clear and brilliant grand piano, the left hand plays accompanying figures on the mellow and soft felt muted upright). All the other sounds (bowed Hackbrett, Guitaret, bass guitar, marimba) are interwoven with both these piano elements to create a levitating atmosphere around it. The whole piece is based on the little fifth-based melody that spins around throughout the whole piece, until the piece finds rest in those choral-like upright chords in the end. In November, I rearranged the piece for a dance performance for a little ensemble, piano, flute, violin and cello and it worked out really great. I hope I can upload a proper recording in the near future. You are currently studying contemporary classical composition. I would love to know more about this area of study and indeed what contemporary classical compositions have served (and continue to serve) the biggest influence on you? You are involved in every aspect of the music-making process, from recording to producing; I wonder do you see these various stages as same thing? CC: Even though I am studying classical composition at the moment, I think my work for the records is something totally different. To include the aspect of recording and producing (which means I indeed totally equate these two things with the process of composing, which opens yourself doors that otherwise would be shut), the aspect of sound in the compositions (and also even the aspect of writing music for an audience), means distancing yourself from existing methods in the contemporary classical scene. Also, of course, my musical language draws equally from popular music and classical music, which also separates me from that particular scene. But despite that, I learned so much from contemporary music, not only from the usual suspects (like Reich or the minimalists) but also from a lot of other totally different composers. The examination of musical form, harmony or mostly rhythm is an ongoing stimulation for my thinking about writing music and expressing yourself through music. I included most of these recent influences in the mixtape I compiled for your site a while ago. Of course all those wonderful composers wrote a hell lot more amazing pieces that are equally worth checking out. Contemporary classical music is a very difficult field of music to get into, especially in Germany, but once you start discovering some of the rare diamonds, you are able to comb through the jungle of terrible stuff that seems to be everywhere you look. You must be very excited to play shows across Europe this December. Forgive the generalization (in advance) but discuss the magical moments and emotions that you, as a composer must experience when performing these piano compositions live to an audience? CC: The tour has been amazing. It’s always great to be on the road with my fellow label friend Poppy Ackroyd, but this tour was even more fun then before. I am very happy with my live set at the moment, playing the new pieces is really special and I got great responses from all the audiences about the concerts and the new album. 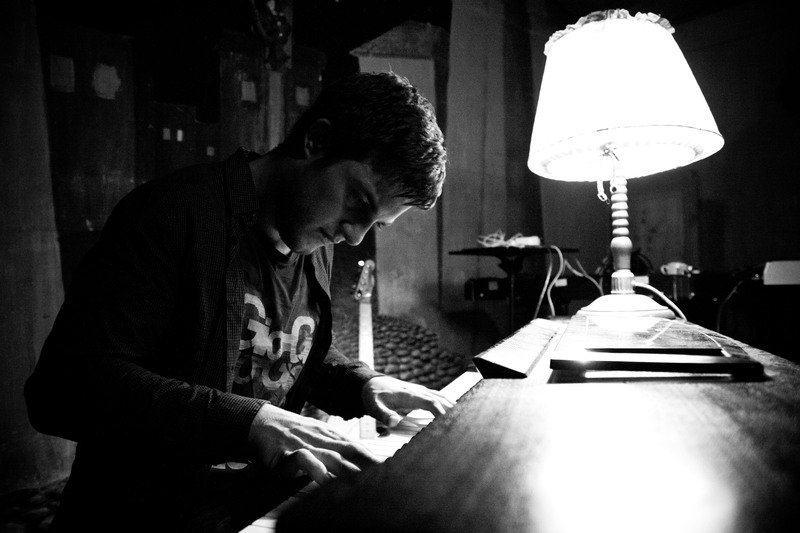 I am also doing a little more improvisation than before, which makes it also more interesting and joy for me to play, because you never know what will happen and you get a chance to explore the different pianos and the different responses from audiences every night in a better way than if you’re just performing the songs. That’s something I really love about touring. What records have you been enjoying the most these past few months, Carlos? CC: The new Björk album. I can’t wait for the vinyl. This album is just so beautiful and amazing, I can’t stop listening and loving it. From the wonderful production to the amazing string arrangements, of course her always fascinating voice and the incredible beautiful and challenging songs/compositions. It’s just perfect. Brian Reitzell’s score for TV series “Hannibal”, very recently released on vinyl. I adored the score in the series, but this collection for the records is even more rewarding!! Alfred Schnittke – Concerto grosso No. I, a wonderful piece by one of the best composers of the 20th century. Even if it is a famous piece, it’s still totally underrated in contemporary classical music. Track premiere: Second Moon Of Winter. Second Moon Of Winter is a new experimental ensemble from Cork, Ireland whose eagerly awaited debut full-length, ‘One For Sorrow, Two For Joy’ will be released on Denovali Records (home to Poppy Ackroyd, Greg Haines, Moon Zero, Carlos Cipa to name but a few) in January 2015. A distinct purity and fragile beauty resonates powerfully throughout the illuminating embers of ‘One For Sorrow, Two For Joy’s rich sonic voyages. The six compositions contained on this hugely promising debut were written and recorded live in a series of four-hour sessions in a basement by the sea in County Cork. The pristine instrumentation of luminous soprano, clarinet and guitar coalesce effortlessly, forming an enthralling cohesive whole of striking depth and magnitude. A whirlwind of emotions merge as the radiant light of joy and hope become inter-woven with the looming darkness of anguish and pain. Second Moon Of Winter is the perfect addition to the German-based independent label of Denovali Records, whose unique blend of sound lies somewhere between avant-garde, ambient, dark free jazz and neo-classical music. On closer inspection, the talented trio form the natural bridge between the deeply affecting experimental odysseys of label-mates Birds of Passage (New Zealand); the cinematic choral works of Hydras Dream (Sweden/Germany) and dark jazz of Dale Cooper Quartet (France). ‘One For Sorrow, Two For Joy’ is about embracing chance; being in the moment and reacting in that moment where the audience and artist become one. 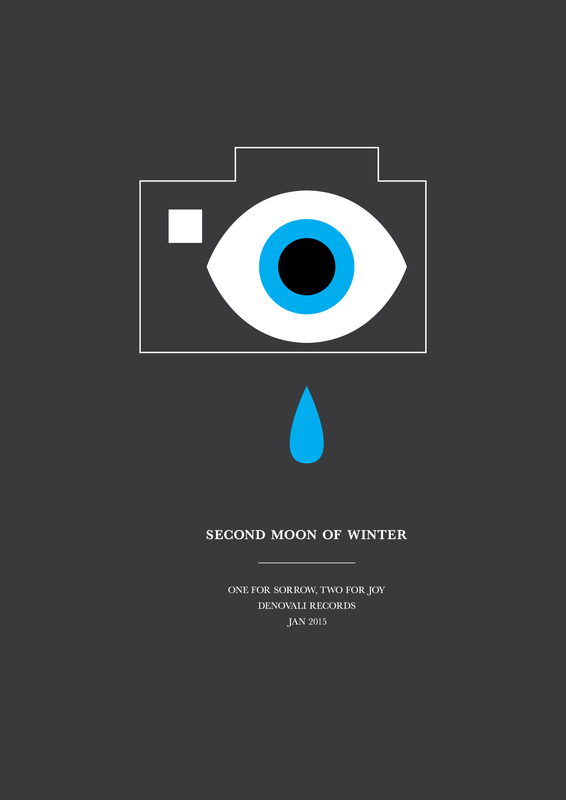 “One for Sorrow, Two for Joy” by Second Moon Of Winter will be available in January 2015 via Denovali Records.